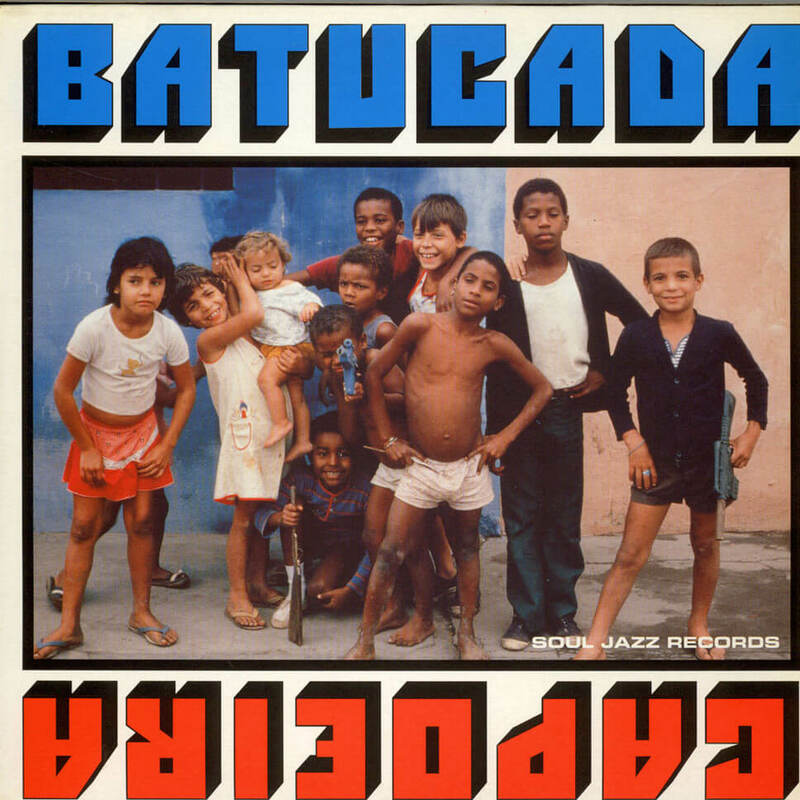 In 1998 the prolific and wide-ranging UK label Soul Jazz released a compilation of percussive Brazilian music titled Batucada Capoeira, a title that described the two styles contained therein: batucada, a percussive, African-influenced style of drumming usually performed by an ensemble and capoeira, a form of dance-fighting invented by slaves in Brazil hundreds of years ago. At the time of the record’s release, Tyler Pope was on tour with !! !, an American band that helped to colonize the liminal space between dance music and indie rock. As Pope tells Rewind columnist Finn Johannsen, the collection struck a chord with the dance-punk bassist, who went on to contribute to other likeminded groups including LCD Soundsystem and Hercules And Love Affair. These days he channels his eclectic musical influences into wide-ranging DJ sets that he performs live or as a host for Berlin Community Radio. So how did you come across Batucada Capoeira? What triggered your curiosity? Through a friend and bandmate of mine! I bought this compilation when it came out in the late ’90s. At that stage we were always looking for stuff that was rhythmic, raw and had energy—stuff that wasn’t punk rock but had the same energy and essence, and I think that’s in batucada. We liked some other great reggae and Latin compilations on Soul Jazz, so I’m pretty sure that’s why he bought this one. We dubbed the vinyl onto cassette and listened to it a lot on our first tour of the states in ’98. It grew on me the more we listened to it on the long van rides during that tour, and eventually I got totally hooked. What attracted you to a sound that is so predominantly rhythmic? I’ve always been drawn to rhythmic music. My dad was a drummer and there was always a drum setup in the house, so it started with that. As a youngster I was into Primus, the Red Hot Chilli Peppers and that whole funk-rock thing. That music primed me for getting into soul and funk music and all other kinds of tribal, rhythmic music. This batucada compilation was probably the first stuff I really enjoyed that was only drums, and thats why it’s special to me and why I chose it for this article. The sound of a bateria, the rhythm section in a samba band, can be quite a complex wall of sound. What is the difference between that and percussive music from other countries, like mbalax or other African styles? Or are they not so different? There are different drums, instruments and rhythms in bateria than there are in mbalax and other African percussion music, and I guess that’s to do with the European influence in Brazil. There are no snare drums in African drum music like sabar or mbalax, and the snare drum comes from Europe. Also I’ve never heard such a large group of drummers playing in such an organized way in African drumming. But the frantic energy of the drum music of both countries is certainly similar. Not every track featured here is as frantic as the drum workouts usually associated with it. What do you prefer? I like this compilation because it mixes some of the frantic workouts and with more minimal tracks, which in my opinion makes for a more enjoyable listen from beginning to end. Some of the other batucada records that I have are just the big frantic drum workouts, and they’re fun to listen to for a track or so, but maybe not as a whole record. Was the compilation a first glimpse of a style you delved deeper into? The tradition of batucada and capoeira in Brazil is rich and sure offers a lot of listening material. I checked it out because it was on Soul Jazz, and at the time it came out other Tropicalia records were being reissued, like Tom Ze, and Os Mutantes other real arty, weird, quality music, so I wanted to hear more stuff from Brazil. I haven’t really gone too deep, or at least deep by my standards. This compilation never really gets old, so if I want to hear something like this I just listen to this record. Capoeira is a form of martial arts developed by slaves. I always found it interesting when music transforms otherwise potentially critical encounters between rivals into a battle of dance moves, such as breaking and vogueing. Yet the music of Batucada Capoeira is comparably more dynamic than its counterparts. Are such aspects important for percussive music? I hadn’t thought about that, but I also like music made for these types of encounters or battles. I love a lot of the new vogue and ballroom club music and recently have been really digging some of the Jersey club battle tracks. The records for dance battles are more beat-driven, and of course they have to be super funky since they have to inspire the dancers. The tracks for battles also cut away at anything that wouldn’t be just for the purpose of the dancing. I really like that focused, rhythm-track energy. It’s also dynamic because people are there playing the drums while the battles are happening, so the drummers feed of the energy of the battles and vice versa. There is a vital element of competition in this sound. I first became aware of this music when I watched football games in Brazilian stadiums. The match between the football teams was extended to a match between rival supporters and their drum groups, and it was quite an inferno. European support seemed very tame in comparison. The competition between the samba schools is as dedicated, albeit in a probably more playful manner. Do you think this serves the quality of the music? Yeah, totally. If you were playing you’d have the passion that all the drums being played together inspires as well as the passion that comes from wanting your team to win. I’ve never been to a football match personally, so I can’t say, but I know that when you come from having less, things like winning football mean much more. You are primarily known as a bass player. Bass guitar is not very important to the sound of batucada or capoeira. But did you learn anything from it as a musician anyway? There’s always a bass type of drum or drums in these compositions. Of course, the amount of notes or bass tones that one can play at one time is limited to one or two drums, so listening to batucada music inspires me as a bass player to play more simply and to think of the bass as a drum. Even just one note can work if its orchestrated well with the rest of the rhythms in a song. I only played one note on certain LCD Soundsystem songs. You are an acclaimed DJ as well. Could you work these rhythms in a DJ set, or do they destroy every tune left and right? What comes to mind with this music as a DJ first is “Good Girls” by Designer Music [aka Carl Craig]. And man, I love to play that track, but it’s more of a DJ tool. Jeff Mills and Derrick May often had a very batucada feeling in their sets, and I know that Derrick May would actually play batucada tracks in his music. I think a lot of the techno that I love is sort of energetic and cacophonous like these batucada records can be. Given that there are so many great examples in Brazil of what you can do with these instruments, why does so much electronic music that tries to incorporate Brazilian influences sound so dull? Is it even possible to achieve something similar with other means? Hmm, hard to say. I’ve never totally attempted to do it personally. I can imagine the people who do it wrong are trying to exactly replicate it rather than taking the energy and feeling that is there and doing their own thing. Also, there’s a huge amount of house music out there that has some kind of Brazillian or “world” influence that is horrible aesthetically. Like the same awful kind of world music that was inspired by people listening to Legend by Bob Marley. Read past Rewind columns with Call Super, Flemming Dalum and more.